Hello everyone and welcome to our guide of 10 best laptops under $700 of 2019. Here we will be listing 10 of the best laptops that will cost you less than $700. To be completely honest, I believe $700 is the right budget for buying a higher mid-range laptop. Anyways, as usual, we have done a lot of research to find the best notebooks that will fit your budget and save your time. Many top-notch brands offer such laptops in a different size, design, hardware, and technology. For such budget, we highly recommend that you get a laptop with SSD since it will be way faster than regular laptops. The $700 laptops can be used for gaming, work and college studies, listed below are the most powerful laptops for this price. These laptops can also be used for playing games and are obviously better than cheap gaming laptops under $500. Most of them will include a 6th generation processor which is faster than ever and also run almost every application. For some people it can get confusing while choosing the laptop and to be honest, I was one of them, and that's when I decided to learn everything about laptops and today I share my knowledge and experience with my readers. Some of the listed laptops are also available for under $650, and these can be used for playing games as well. So here you will find the best laptops under $700 from different brands and series', and other than short reviews you will also find the quick specifications of each laptop. Should you buy one of the best laptops under $700? These days there are many high-end laptops available even for under $500 and should always consider those first. However, you need a more powerful laptop then you might want to look at best notebooks under $700. In case you need a laptop for browsing, checking emails, MS Office and other necessary applications then you should certainly look for a budget laptop as it has enough power to handle these tasks. But if you're looking to play some solid games or running applications like AutoCAD then only you need a $700 laptop. Other than laptops, you will also see some 2-in-1 devices and ultrabooks in our guide, and these notebooks can be used for almost everything. What to expect from a laptop under $700? First of all, you should expect a minimum Intel Core i5 processor and in some cases Intel Core i7 processor. And if you're looking for a laptop to play games then you should also look for a decent GPU. Other than that, you should look for minimum 8 GB RAM and don't even look at laptops that offer less than that. The touchscreen display is another factor that you need for such price and of course solid state drive. Well, we have shortlisted these laptops under $700 below, and you can buy one of them with full confidence. Overall, these notebooks can perform high-end games and applications that need power with ease. The Acer Aspire E 15 E5-575G-76YK is available on the market for exactly $700 and is one of the high-end gaming laptops for this price. ​ It features 6 hours of battery life and 7th generation Intel Core i7 processor. I'd say that's more than enough for such price, but it doesn't end there, it also includes 8 GB DDR4 RAM and 256 GB SSD. On top of that, a special bonus for gamers is its ​Intel 620 GPU which is good enough to handle most of the full HD games. Its 15-inch Full HD display is another treat for gamers as well as multimedia users. It's also available with Intel Core i5 processor in case you'd like to save $150 on your laptop. Overall, Acer has done a great job on this one, and it's an excellent laptop for under $700. The 13-inch ultrabook by ASUS ZenBook series might cost you a little bit more than $700, and I believe it's totally worth it. Also for additional $12, you can get a wireless mouse which is a great deal in my opinion. Its full HD Anti-Glare IPS display is simply a treat for eyes and can be viewed from a 170-degree angle. It has all the latest hardware including 6th generation processor and ultra-slim full aluminum body. It also features a full HD 1.2-megapixel webcam which is designed to compete with MacBook's webcam. Most of the people get confused between this one and Dell XPS 13, and it becomes confusing at that point since both are great laptops with premium features. I would prefer ZenBook any because it's more light, more powerful, better looking and has a better display. All in all, it's an elegant PC for a decent price and is totally worth it. The Lenovo ThinkPad T450 is a 14-inch ultrabook that's specially designed for businessmen. It's one of the best laptops for business users and of course a lot better than HP Elitebook. It's a little bit old now but still, performs as robust as it used to and it's powered by Windows 7. It offers excellent performance for a decent price, and it has the feature of fingerprint readers. Unlike other business notebooks, it can be upgraded to 32 GB RAM which will certainly make it faster than any other laptop under $700. Its battery life easily lasts for about 7 to 8 hours which is phenomenal. In case you're looking for a laptop with Windows 10 then you can easily upgrade it within a couple of hours. Its speakers are of excellent quality and pretty loud. To be honest, it might not be ideal for gamers or college students, but it's certainly the best business laptop. The Asus Zenbook UX305FA has an all-aluminum body—making it very durable—with a sturdy metal hinge to support the 13.3-inch screen. The laptop is equipped with an Intel Core M-5Y10 processor and has an adequate 0.8GHz speed. The laptop runs Windows 8.1 and the full HD screen eliminates glare and reflections, in the brightest of outdoor light. This Zenbook is lightweight and slim, which makes it an ideal choice for regular travelers and students. It features great audio, thanks to Bang and Olufsen's ICEpower technology, and the integrated Intel HD graphics 5300 card offers decent video and graphics. Loaded with 8GB of RAM, this laptop is able to handle most tasks with speed. The storage capability out of the box is limited to 256GB but this can be upgraded or you can use an external flash drive or HDD. The laptop is available in a sleek black finish. It is Bluetooth enabled and well equipped with ports, including 3 x USB 3.0 and a micro HDMI port. The device also features a microphone input, headphone output and an easy to use touchpad for navigation. The Zenbook is supplied with a charger and battery life is an impressive 6+ hours, before it needs to be connected to the power. New for 2019 is the Lenovo IdeaPad 330s with a “wear and tear” protective finish, and rubberized detailing on the base for grip. The laptop is fitted with the Intel Core i5-8250U processor that gives up to 3.4GHz speed. This IdeaPad is loaded with the latest version of Windows 10 home. The 8GB RAM (plus 16GB Intel Optane for improved multitasking) handles web browsing, audio streaming and video playback with ease. The display is powered by Intel HD graphics 620, which offers crystal clear viewing. It has a 15.6-inch HD anti-glare screen, which makes it an ideal choice for watching movies indoors or outside and Its portability is ideal for home or office use. The IdeaPad 330s also has great storage capabilities with its 1TB HDD built in. This can be upgraded if you value boot and application startup speed over storage capacity. The laptop has adequate ports, including two USB 3.0 ports, HDMI and an ethernet port. There are microphone and headphone jacks on the side of the laptop and the touchpad is responsive and easy to use. The IdeaPad 330s is supplied with a power adaptor and has an average battery life of 5 hours. The HP Pavilion Flagship Laptop is a full package of power, performance, and portability. You can use it almost anywhere without worrying about its battery life as it's known for lasting more than 7 hours. Since its release in last December, it's among the best sellers and also features a Full HD Touchscreen IPS display. Its 6th generation Skylake Intel i7 processor with turbo boost technology makes sure that your online game load faster than your competitors. It packs integrated Intel 530 graphics which is good, but a GPU would have made this laptop a lot better for gaming. I have personally tested this one, and all I could say is, it's quiet, faster, nicely designed and light. You might read some negative reviews about its noisy fans, but the device I tested was remarkably silent even while rendering. The Acer Aspire V3-572G-54S6 is yet another one of the best gaming laptops under $700, and it features Acer's CineCrystal technology display. Few games like League of Legends, Minecraft, Dota 2 and Warframe worked fine on high settings and in case you want to play a better graphics game than these then this might not be the best choice for you. When it comes to looks, it's very stylish and slim. The best thing about this notebook is its boot time which is less than 30 seconds. Its battery life is decent, lasted about 6 hours on medium brightness. If you're looking for a light and portable laptop, then this certainly isn't the best option for you as it weighs almost 6 pounds. Also, it isn't ideal for multi-tasking, and I never had any issue while multi-tasking but just saw a review by a certified buyer. Also, note that while playing games it might reduce its battery life to around 2 to maximum 3 hours. Finally, here comes the Dell Inspiron i5559-5347SLV, the 15-inch laptop that comes with a full HD touchscreen display. It's an affordable PC that comes with a professional design, and I am sure you'll love it. Additionally, it's available with RealSense technology display which is way better than an ordinary screen. It has plenty of positive reviews, and most of the customers are happy with its performance and build quality. It's designed elegantly, and whatsoever there's no issue with its design. SSD could have made this PC a lot faster and quiet as HDD isn't silent. I have compared it with some laptops that cost around $700, and this is great touchscreen laptop, but I wouldn't recommend it for playing games. Its performance is undeniably good when it comes to browsing, running applications and watching movies. Its full keyboard helps people that prefer traditional numeric keypad, and with 6th generation processor, this particular PC is incomparable. The HP 15 is currently priced at well under $400. It's very popular laptop among buyers seeking a touch-capable device This laptop supports multi-touch gestures so you can pinch, zoom, swipe the display to control various functions. It's a great laptop for watching movies as well and overall; I am impressed with its performance. It can be used at home, office and even while traveling. Its responsive touchscreen display is simply a treat for fingers. The laptop is relatively lightweight at 4.3 pounds and has decent battery life of up to 7 hours of mixed use (Internet surfing, video streaming). It comes with plenty of bloatware by HP and Microsoft, and you can decide what you want to keep and what not. All in all, it's a perfect notebook that can easily run games like World of Warcraft, Sims 4, Dota 2 and Minecraft. 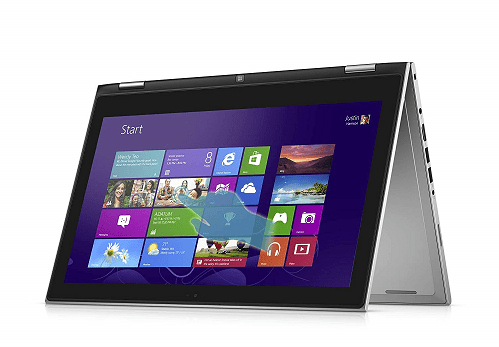 The Dell Notebook i7347 is a 13-inch convertible touchscreen laptop and is widely known as Ultrabook. It offers two modes, a laptop, and a touchscreen tablet. It might not be the top-notch premium device like Microsoft Surface Pro, but it surely is worth $700. It's a great value PC, and if you can afford to replace its HDD with SSD, then you have a beast in your hands. While using the tablet, it feels very rubbery which is kind of nice and it gives you a good grip on the device. It's a little bit heavier than I thought it would be and you can't hold it as a tablet for a long time. If you compare it with Lenovo Yoga 3 Pro, then this one certainly beats it when it comes to price and power. According to most of the reviews, customers are jubilant using it, and you will rarely see any negative reviews about it. So this is our list of best laptops under $700 in 2019, and here you'll also find a couple of laptops that cost under $650. We have ranked them according to performance, compatibility, hardware, portability and user reviews. They all are totally worth the money and you will also find some of the best gaming laptops here in this guide. Anyways, we hope this guide will help you choose the right device for you and in case you're little less on a budget, feel free to check our guide of best laptops under $600. Most of the listed laptops include an Intel Core i7 processor and minimum 8 GB of memory. If you're still in doubt or confused, then feel free to contact us, and we'd be more than happy to help you.